Her hopes rest on becoming the next bodyguard to Audblayin, the rain forest’s divine ruler of growth and fertility. But to earn that title, Unar must embark on a dangerous quest into the shadowy depths beneath the treetops. Down below, she must confront enemy tribesmen, battle notoriously giant monsters, and master frightening new magic. Most importantly, Unar must forget all the truths she had sworn her life to uphold… and be willing to risk destroying the very home she loves to seize her destiny. THORAIYA DYER is an Australian writer whose more than 30 short stories, as well as a novella and short fiction collection published since 2008 have racked up 7 wins from 17 Aurealis and Ditmar Award nominations between them. 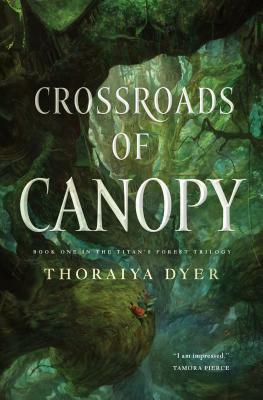 Her debut fantasy TITAN'S FOREST TRILOGY is published by Tor Books.